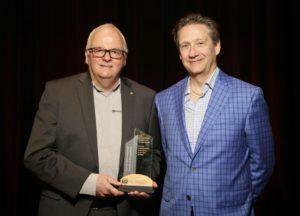 On March 27 in Bermuda, at the Canadian Construction Association’s (CCA) annual conference, Jean Pouliot, President of PMI Structures and Prometek, was one of the recipients for the Manufacturers, Suppliers and Services Award of CCA for 2018. These awards recognize the important contributions of individuals, companies and associations that promote and enhance the Canadian construction industry. Congratulations to all the winners for this great accomplishment.